I have had a lot of trouble in the past keeping track of leftovers. Weeks after I put something in the fridge, I'll find in a container in the back . . . full of fuzzy and smelly food! So I devised this plan. I have a whiteboard hanging right next to the fridge. When I put leftovers in I write what it is and the day I put it in. As I use it I just cross it off. Then I erase and start over at the beginning of the next week. We are actually using our leftovers and I no longer find disgusting, moldy leftovers in the back of the fridge. Works for me!! 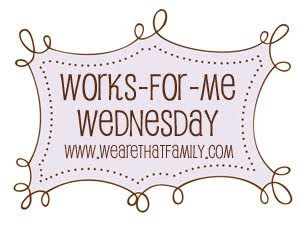 Go to We are that Family for more great tips and ideas! Wow - what a simple but great idea! And I even already have a small white board! I think that I know need to be on the hunt for a small white board! Food rotting in the fridge is my big down fall. Might have to adopt that one too! !